Place the lukewarm milk, sugar and the yeast into a bowl. Stir well to dissolve the sugar and the yeast. Let it rise for 10-15 minutes.Then, add the salt, egg white, oil and flour, knead for about 10 minutes. Place a plastic wrap over the dough (see the picture) and let it rest for 2 hours or till it rises up to double its shape (see the picture). Grab egg sized pieces from the dough and flatten it into a rectangular shape. Elongate and spread ½ tsp butter all over. Then, roll it lengthwise and get a stick like long dough piece. Hold the ends and twist from the ends towards opposite directions, till getting some nice twists. Stick the ends making a wheel shape (see the picture). Place them on a greased baking tray, leaving some room. Cover the pogacas with a plastic wrap or cloth and leave them to rise for an hour. Then, brush them with whisked egg yolk and sprinkle with some sesame seeds/nigella (optional). Preheat the oven to 400 F (200 C) and bake for 10 minutes. Turn the heat to 375 F (190 C) and bake for 15 more minutes till they turn golden brown.Serve warm. P.S: For softer pogacas, after taking them from the oven, cover their surface with a clean cloth and make it air proof. Ilik suyu ve mayayi bir kaseye alin, icine sekeri ilave edin ve sekerle maya cozunene kadar iyice karistirin.10-15 dakika kabarmasini bekleyin. Sonra, sut, yumurta aki, sivi yag, tuz ve unu ilave ederek, 10 dakika kadar yogurun. Uzerine seffaf film ortun (resime bakiniz) ve sicak bir ortamda, hamur iki kati kadar kabarana dek, yaklasik 2 saat, bekleyin (resime bakiniz). Yumurta buyuklugunde hamur parcalari koparip, elinizle acip uzunca bir dikdortgen elde edin. Yaklasik 1cay kasigi tereyagini hamurun uzerine yayin ve uzunlamasina rulo seklinde yuvarlayin. Elde ettiginiz uzun ruloyu iki ucundan tutun ve ters yonlere dogru iki ucunda hafifce kivirarak burgular olusmasini saglayin. Sonra uclarini sikica birlestirerek simit seklini verin (resime bakiniz).Yaglanmis tepsiye aralikli olarak yerlestirin.Uzerlerini strec film ya da bir ortu ile ortup, yaklasik 1 saat boyunca tekrar kabarmasi icin bekleyin. Uzerine yumurta sarisini surun ve susam/corek otu ile susleyin (istege bagli). Onceden isitilmis 200 C (400 F) firinda 10 dakika pisirin. Sonra 190 C (375 F) de 15 dakika daha pisirin. Uzerleri kizardigi zaman cikarin. One note, however, in your english version you say that the yeast should be dissolved in the warm milk and sugar and you never say when to add the warm water. 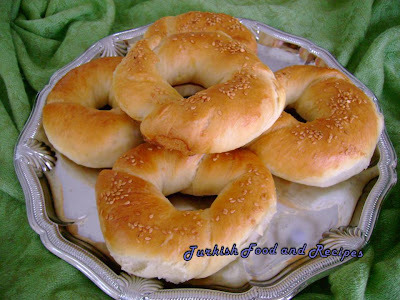 After reading through your turkish version I think you mean for the yeast to sit 15 minutes in the warm water, sugar, and yeast mixture and then add the milk, oil, salt, egg white, and flour. This is how I made my acma, and they turned out great!